Poor Eddie got his head stuck in a gallon can of pork and beans. 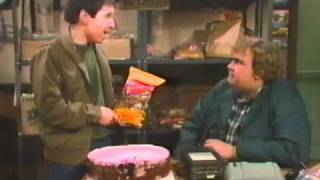 John Candy ("Roy") repairs broken eggs, messed up cakes, broken taco shells, and removes lint from toast. But he doesn't put old Thanksgiving turkeys back together or put salt back on pretzels. We're counting flowers on the wall in the lab with Bunsen and Beaker. 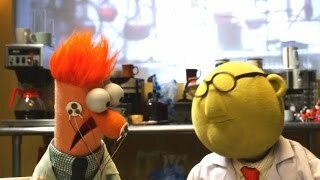 Watch as Beaker tries to fill the void left behind by Dr. Bunsen Honeydew.